WordPress is the most widely used website software in the world, powering over 33% of all sites on the web. WordPress is defined as a content management system (CMS), meaning that it is software that you can use to create and publish content. It is also a powerful website builder, which you can use to build all sorts of different sites. Other common content management systems and website builders include Joomla, Drupal, Wix, SquareSpace and Blogger. But WordPress is by far the best. In fact, many many of the world’s biggest websites use it, including Time Magazine, TechCrunch, The New Yorker, Healthline and others. It also powers a large percentage of small to medium-sized websites, including everything from personal blogs and photo galleries to shopping sites and forums. Here are 11 compelling reasons to use WordPress for your website. One of the best things about WordPress is that it is 100% free. WordPress.com: Here you can create a free site that has the URL yoursite.wordpress.com. WordPress.org: This is the “self-hosted” WordPress software, which you can download and/or install for free with most web hosting companies. If you’re just planning to have a small personal blog, then the first option is fine. But choosing the self-hosted version is definitely recommended if you are serious about your site and want to get a lot of traffic. Fortunately, most web hosting companies provide a very simple way to install the self-hosted version of WordPress. It is about as simple as installing an app on your phone or computer. In this case, the WordPress software itself is completely free but you do need to pay for a domain and web hosting. Bottom Line: WordPress is 100% free open-source software. Most good web hosts have a simple installer you can use. But you can also create a free blog at wordpress.com if you just want to have a small personal blog. It’s incredibly important to have a fast website. Not only is site speed an official ranking factor in Google, but it’s also really important so that your readers have a good user experience. If your site is fast and pleasant to use, then people will be more likely to return to your site and even link to it from their own sites. On the other hand, some people aren’t even willing to wait for a slow website to load. Many potential readers and followers will simply hit the back button if your site hasn’t loaded within a few seconds. Fortunately, WordPress is incredibly lightweight and fast if it is set up correctly. 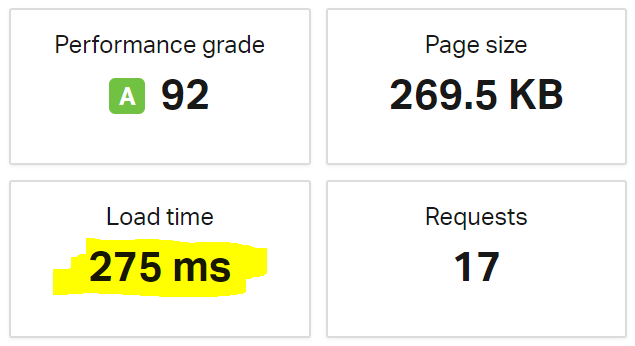 This site, which is hosted with a very fast web host called Kinsta, actually loads in less than a second on a fast connection. WordPress is also incredibly stable and secure. I’ve owned many websites using WordPress that have served hundreds of millions of readers, often with more than a thousand people viewing a site at the same time. None of my sites have ever been hacked and I’ve never lost data because of a crash. As long as you’re using a good web hosting company, then the site should remain fast and secure 24/7/365 with virtually no downtime. Bottom Line: WordPress is very lightweight and fast if it’s configured correctly. It is also stable and secure and able to handle massive amounts of traffic. If you want to get a lot of traffic to your site from search engines, then WordPress is the best website software you can use. It offers built-in SEO options like the ability to add title tags and descriptions. It also has clean code that is easy to access and navigate for both users and search engine bots. You can also beef up your site’s SEO performance with free plugins like Yoast SEO. This will enable you to create a sitemap, which you can submit to Google so that they know which pages to look for on your site. If you search for different terms in Google then you will often find websites powered by WordPress on the front page, if not in the #1 spot. Many websites using WordPress get tens of millions of visits each month from search engines. Bottom Line: WordPress is very good for SEO, but you can enhance the SEO capabilities even further with free plugins like Yoast SEO. Many WordPress-powered websites get a ton of traffic from search engines. One of the best things for beginners is that WordPress is incredibly simple to use. For example, the article editor is even more simple to use than Microsoft Word. There’s no coding required, you can just use the visual editor to add paragraphs, headings, lists, images and all sorts of other features. Here’s a screenshot from the WordPress text editor while I was working on this article. You can see the simple controls to format the text and add different features. If you want a super simple way to build a website and publish great content, then WordPress is definitely for you. Bottom Line: The software is incredibly simple to use. For example, the text editor is even easier to use than Microsoft Word, allowing you to create great content with a lot of useful features for your readers. Many people think that it is really hard to create a website because they don’t know how to code. However, this is definitely not a problem with WordPress because you can do almost anything without having to touch a piece of code. Themes: These are website templates that change the look, feel and structure of your site. Plugins: These are like apps that you install on your site to add a certain type of functionality. For example, making your site faster or adding social media buttons. You can find thousands of free themes and plugins in the WordPress theme library and plugin library. You can use these to add pretty much any feature you can think of to your site. It is also super easy to update and maintain themes and plugins. You get a notification when a new update has arrived and can usually install it with one click. Bottom line: WordPress is incredibly easy to customize with themes and plugins that can change the functionality of your site with a few clicks. Although WordPress was originally designed as a blogging platform, it has evolved into much more than that. You can basically create any type of website you want with WordPress. For example, the free WooCommerce plugin turns your site into a shopping or eCommerce site. This is the tip of the iceberg. WordPress supports pretty much any type of media you can think of. For example, if you want to add a YouTube video to your content, you simply paste the video link into the editor and it automatically loads the video embedded and formatted correctly in your article. Bottom line: You can use WordPress to build all sorts of different types of websites and publish many different types of media. WordPress has a massive community online with both experts and beginners making new features and finding solutions to problems. If you get in trouble with something, then it is almost guaranteed that you can find a solution to it with a simple Google search. In addition, there are thousands of great YouTube channels that have useful videos about solving problems, adding new features and more. The best themes and plugins are also well supported at the WordPress support forums. You will find the creators themselves answering questions and helping people find solutions to problems. I have almost never come across a problem with WordPress that I wasn’t able to solve with a simple Google search. Bottom Line: It is very easy to find solutions to various WordPress related problems with a search on Google or YouTube. The official support forums are also very active. A big problem with many website builders is that you are dependant on them to host and support your site. For example, if they were to go out of business then your site would disappear. In extreme cases, they could even ban you for posting content that they don’t like. But with WordPress, you are in full control of your own site. You choose your own web host and can easily move your site to another hosting company. You can also easily take backups of your website using free backup plugins in case anything ever happens to your hosting company. Bottom Line: If you own a WordPress site then you control it yourself. Hosting your site with a website builder can be risky in case something happens to them. It’s incredibly easy to host a WordPress website, especially if you use a managed WordPress hosting provider (I use Kinsta). The best hosting providers will handle everything for you so that you won’t really need to worry about server configuration or security. In addition, most of them take automated backups every day. In case something happens, you can easily restore your site with a few clicks. Bottom Line: It is very easy to host your site with most of the big hosting providers. They handle everything server-related so you can focus on building a great website. Most people browsing the web are doing it on their smartphones. 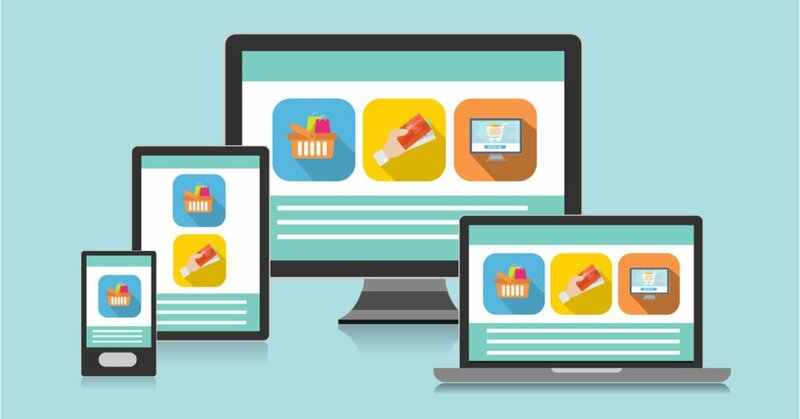 Because of this, it is absolutely crucial that your website automatically adapts to different screen sizes. It should look fantastic and be easily readable on any computer, tablet or mobile device. Most of the good WordPress themes are “responsive” — which means that the look and feel automatically adapts to the size of the screen. So making your site responsive and mobile-friendly is simply a matter of choosing the right theme. Bottom Line: Making a WordPress site mobile-friendly is simply a matter of choosing a theme with a responsive design and making sure that it looks good on all devices. Another good thing about WordPress is that it is open-source software. This means that anyone can contribute. There is actually a massive community of super smart programmers and developers that are constantly working on improving it. 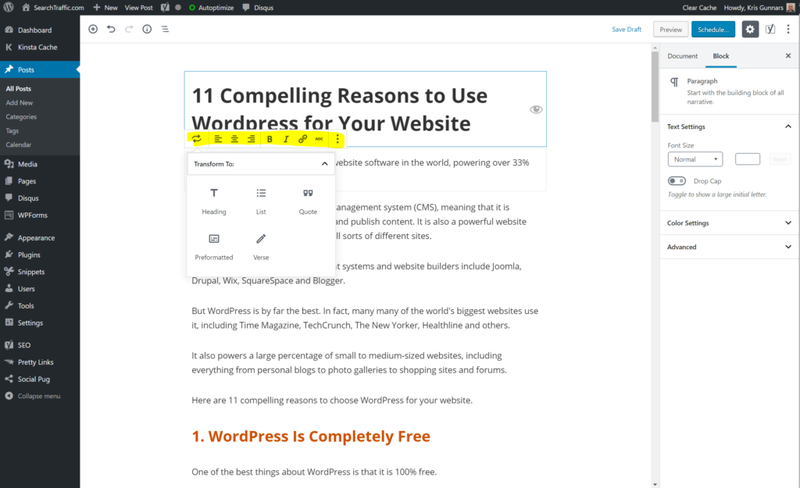 For this reason, WordPress is constantly getting better with each update and you can always update to the latest version with a click of a button.